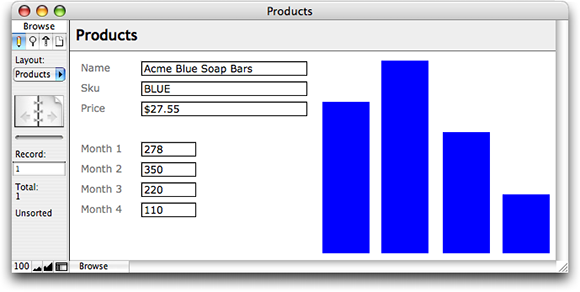 Another day, another awesome new FileMaker 9 feature. Today’s special: so called *data URLs*. In a nutshell, you don’t need a web site to use web viewers anymore. Now they can easily (read: without crazy exports and obscene path hacks) show data pulled right from the FileMaker database itself. This is, like, *way* cooler than it sounds. The key is the scheme “data” which tells the web viewer you’ll be sending the *data* of the page right there in the URL. 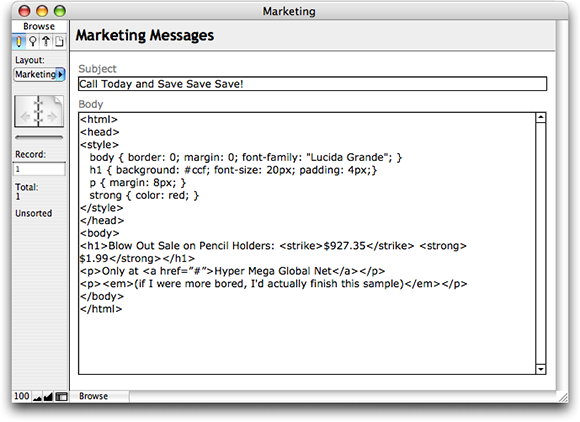 The `text/html` bit tells FileMaker what kind of data you’re sending in. You can supply any standard [mime type] you want, so long as you also provide proper data. In general, though, you’ll probably always use `text/html` because you can’t easily produce other kinds of data in a calculation. > Note: Some of you may be thinking, “Hey, I could do this in 8.5 too!” and you’d be right…to a degree. In 8.5, data urls were partially implemented. They worked well on Mac OS X, and, with different syntax, on Windows. But they were very unreliable on Windows, and occasionally failed on the Mac as well. In FileMaker 9, data urls are reliable and consistent across both platforms — and ready for prime time. Let’s be honest with each other. How often do you *really* have HTML in your database? I thought so. So is this whole data url thing a cool-but-useless novelty? Nope. If you get creative (and learn a little HTML) you suddenly realize you can do some seriously cool stuff. We’re not talking about dumping a web page on the layout. We’re talking about using the dynamic and flexible nature of HTML to present information in your database in ways that were never possible before. This page uses HTML `DIV` elements to display each bar. The `DIV`s are positioned at the bottom of the page, set with various heights, and spaced across the page evenly. Complicated? Yes. But functional, real time, plug-in free, and not *too* complicated. You can use this generated HTML technique in infinite ways. For example, recently we posted [an article](http://sixfriedrice.com/wp/scaling-images-in-a-web-viewer/) on using web viewers as network-enabled container fields. That (pre FileMaker 9) technique required putting the helper file on a web server. You could eliminate that need, and make your system a little more portable, by generating the needed image scaling HTML right in the web viewer calculation. The new data url system in FileMaker unlocks huge potential. Here’s to many happy hours exploring that potential. There are two answers to this question, so far as I know. If you just want to trigger a scripted process of some kind, and it is OK for the script to run on the server then you can use a Custom Web Publishing URL in a link tag in the web viewer to trigger the script. I don’t have direct experience with either, but I believe both can help you do what you want. Sorry I missed your comment. I wonder if the problem is that your PDFs are stored in the container field. The technique described in the comment thread will only work if the container holds a reference to the PDF, which is found on an accessible drive. If you want to do something similar with stored container content, you may need to use a script that does an Export Field Contents to a path (using Get(TemporaryPath) ideally) and then loads the PDF from there. There may be ways, using plug-ins or something, to get at the raw data, Base-64 encode it, and turn it into a data url . I have not tried that technique but I’ve heard people talk about it. You only need to parse out the Field/Value data! I also have it working based on a text field in the database which is an html form. 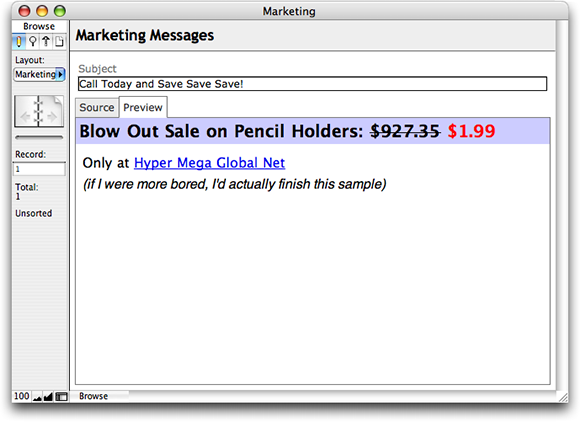 The Webviewer displays that form, and, with a little calculation magic, displays that submitted data using the calc above. I’ll save that one for another time. Thank you for this. Brian Schick’s formula is very cool. Hello, very cool. I hope I’m not too late…. I would like to modify something in order to get which is the selected record. Is it possible ?? Geoff, this is great stuff. Nice! I have a question. Is any of this stuff documented anywhere in FileMaker’s documentation? Is there any definitive documentation for any of this stuff anywhere? In particular, I’m curious as to what other “data:…” options are there for webviewers? It became popular among some FileMaker developers, so FileMaker added some special support in a later version so this would work properly on Windows too, where the system-level browser technology did not support it properly. But in the end, it is a web standard, not a web viewer feature. Very useful resource. Is there a way to order the lists? I’ve played with ul & ol tags to no avail. Any suggested resources to find more information? I am trying to use this with IWP. If I just use a regular web address, everything works fine. If I use the example, I get a blank box, that has resized. Works great in FM, but not in the viewer when viewed via IWP. Could this be something in the HTML? HELPPP – Demo on Tuesday! Thanks for this great example. What would make if really powerful is to have hyperlink to related records or scripts within the solution. Is this possible now at v12?